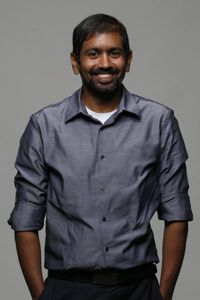 Snehal Shingavi is associate professor of English at the University of Texas, Austin, where he teaches South Asian literatures in English, Hindi, and Urdu, as well as the literature of the South Asian diaspora, including Asian American literature. He received his PhD in English from the University of California, Berkeley and has taught previously at Notre Dame de Namur University and the University of Mary Washington. He is the author of The Mahatma Misunderstood: the politics and forms of literary nationalism in India (Anthem Books, 2013). He has also translated Munshi Premchand’s Hindi novel, Sevasadan [The Orphanage] (Oxford, 2005), the Urdu short-story collection, Angaaray [Firebrands] (Penguin, 2014), and Bhisham Sahni’s autobiography, Today’s Pasts (Penguin, 2015). With Vasudha Dalmia, he has also published a translation of Agyeya’s Shekhar: A Life (Penguin, 2018). He is currently working on two book-length manuscripts (The Country and the City, the Jungle and the Slum: the neoliberal landscapes of South Asian literature and A Critical History of Hindi Literature) and several translation projects (Joginder Paul’s Urdu novel A Single Drop of Blood, Yashpal’s Hindi novella Geeta: Party Comrade, and Mannu Bhandari and Rajendra Yadav’s joint Hindi novel The Barest of Smiles). Students in this class will be exposed to a number of political, historical, and literary contexts and be expected to engage with the readings in class in a thoughtful way. Requirements & Grading: There will be a series of 3 short essays, the first of which will be revised and resubmitted. Subsequent essays may also be revised and resubmitted by arrangement with the Instructor (75% of the final grade). The remaining 25% will be determined by short assignments, quizzes, and participation. Recently, both Postcolonial Studies and Subaltern Studies have suffered from critiques from within as important thinkers in both traditions have begun to disavow what those projects were about. At the same time, a dissident movement of Marxist and materialist thinkers has also attempted to situate different critiques of both movements as inadequately attentive to history and excessively concerned with textuality and discourse. This class considers the implications of these new developments on the study of literature from the postcolonies and neocolonies of today. Description: This class will cover the long career of Salman Rushdie, arguably the best-known South Asian writer living today. We will be interested in tracking not only his rise as the darling of cosmopolitan reading publics but also as a lightning rod for the debates about civil liberties and religious belief, as well as his role in promoting the Indian Anglophone novel (usually, at the expense of imaginative literatures in the other modern South Asian languages). At the same time, we will also be interested in considering how his career has been highly generative of much of the critical thinking that comprises postcolonial literary criticism today. We will be reading Rushdie’s work carefully with an eye towards generic categories (magical realism, children’s literature), South Asian politics and history, postmodern philosophy, and the critical reception of his texts. Texts: Shame; Midnight’s Children; Satanic Verses; Step Across this Line; East, West; Imaginary Homelands; Haroun and the Sea of Stories; Enchantress of Florence; The Cambridge Companion to Salman Rushdie. Requirements & Grading: Critical Review Essays (4, 2 pages each) – 40%; Final paper (8-10 pages) – 25%; Course blog (250 words weekly) – 10%; Final cumulative exam – 15%; Participation – 10%. This will be a course on the canon of theory of decolonization (Fanon, Cesaire, Sartre, Lenin, Gandhi) and the literatures of the movement for independence in India. We will be interested in understanding: whether nationalism and anticolonialism are isomorphic; how nationalism contended with minorities; how nationalism reconciled class conflict; what did nationalism do to reconfigure gender and race; etc. We will also be asking what kind of role literature was asked to play in the struggle against imperialism, especially when that literature was written in English. Students in this class will be exposed to a number of political, historical, and literary contexts and be expected to engage with the readings in class in a thoughtful way. This course carries the Global Cultures flag. Global Cultures courses are designed to increase your familiarity with cultural groups outside the United States. You should therefore expect a substantial portion of your grade to come from assignments covering the practices, beliefs, and histories of several non-U.S. cultural groups, past or present. Texts: Salman Rushdie, Satanic Verses; Faiz, Rebel’s Silhouette; Sinan Antoon, I’jaam; Mahmoud Darwish, Unfortunately it was Paradise; Asad, et al, Is Critique Secular? ; New York Times, Open Secrets. Requirements & Grading: 4 short papers (3 pages) – 60%; 1 final paper (7-9 pages) – 30%; Participation (may include quizzes) – 10%. Description: Two important historical trends have marked the development and recognition of “Indian literature” as a global (rather than a strictly national) phenomenon. First, the patterns of migration of South Asians since the beginning of the Raj moved Indians to various parts of the British Empire and created a network of ambassadors and webs of affiliation throughout the world for South Asian culture; the fact of colonial schools which produced English-speaking Indians is not incidental. Second, the celebrity of Rushdie as the premiere Indian writer helped to produce a niche market within the publishing world for books about and by South Asians (usually represented by the big, national novel). To this must also be added the contemporary rise of India as a leading world economy which has raised the demand for and curiosity about Indian culture within the global marketplace. This course will investigate the production of a “global Indian literature” – paradoxically cosmopolitan and national – as made up of the intersecting experiences of Indians outside of India and the demands of the literary market (international publishing houses and the big literary prizes). All of the writers that we will consider have won major national and international prizes (the Nobel, Man Booker, Commonwealth Writers, Pulitzer, etc. ), and this will allow to think about what kinds of issues, what kinds of histories, and what kinds of forms tend to predominate in this body of writing. Texts: Tagore, Home and the World; Rushdie, Satanic Verses; Roy, The God of Small Things; Mistry, A Fine Balance; Lahiri, Interpreter of Maladies; Naipaul, A Bend in the River; Chatterjee, The Mammaries of the Welfare State; Ghosh, Sea of Poppies; Seth, Golden Gate; Desai, In Custody. Requirements & Grading: Weekly blog posts, 250 words (20%); Midterm (20%); Final (30%); Paper, 6-7 pages (20%); Participation (10%). The course will provide a survey of the major figures in the Indian novel. Beginning with vernacular forebears of the novel (the dastan, the qissa, the kadambari) and moving through major Anglophone novelists of the post-independence period. This class is designed to give students an overview of the major movements in Indian literature (progressivism, experimentalism, "shadowism," etc.) and to have an understanding of the major debates in the literary critical tradition. We will read important novels from Hindi and Urdu in translation (Premchand's Sevasadan, Qurrutalain Hyder's Aag ka Darya, Ismat Chugtai's Tehri Lakir) and put them alongside Anglophone novelists (Rushdie, Roy, Ghosh). In so doing, we will be relying on debates in theories of the novel (Watt, Moretti, etc. ), debates in comparative literature studies, and debates about postcolonial theory and practices of reading. In particular, we will be attempting to ask whether the novel and modernism are invented first in the west and transplanted to India, or whether formal experimentation and literary reactions to modernity have alternative genealogies. We will also be interested in the evolving notions of Indian feminism as it is debated in literary texts. Description: Globally, the ideas of Karl Marx and Friedrich Engels are gaining a new hearing, as the financial crisis of 2008 shattered the mythology of a triumphalist capitalism. This class will cover all three volumes of Marx’s famous book, Capital, and attempt to use its terms to make sense of contemporary economic systems. We will be interested in Marx’s theories of the commodity, historical transformation, productive relations, and social organization. We will also attempt to theorize literary production under capitalism by looking at pieces of fiction and poetry. Requirements & Grading: Midterm exam – 30%; Final Exam – 40%; Weekly blog posts – 15%; Participation – 15%. Description: In the last twenty-five years, global interest in Pakistani writing has flourished. Partly because of Pakistan’s important role as a frontline state in the war in Afghanistan and partly because of an increase in the number and quality of writers from Pakistan, international publishers have found willing audiences for new Pakistani products. Alternatively, though, this writing still finds itself having to contend with western biases about Pakistan. This course will chart the major themes and directions of Pakistani writing to understand both how Pakistan is represented and how it is consumed/marketed: why are certain kinds of fiction necessary to represent the Pakistani nation? Can the nation ultimately be represented? We will also be interested in major themes: history, Islam, gender, nationality, migration, and class. We will read writers from Pakistan as well as Pakistanis in the diaspora. Students are not expected to have a historical background in South Asia, but are expected to be curious and inquisitive. Texts: (possible) Rushdie, Shame; Suleri, Meatless Days; Kureshi, My Beautiful Laundrette; Hamid, Reluctant Fundamentalist; Mueenuddin, In Other Rooms, Other Wonders; Aslam, Maps for Lost Lovers; Sethi, The Wish Maker; Naqvi, Home Boy; Sidhwa, Crow Eaters; Ali, The Duel. Requirements & Grading: Midterm exam – 25%; Final exam – 30%; Course blog (500 words weekly and peer reviews) – 30%; Participation – 10%. Description: This class will consider how fiction from the post-9/11 era (widely called the “Global War on Terror”) has produced a particular vision of Islam and Muslims that both reproduces and challenges the ideology of Islamophobia and refines and critiques prior understandings of Muslims. We will be interested in thinking about the deployment of Islam in political rhetoric; depictions of Islam and Muslims in popular culture; debates about Islam that have entered national life in the US; and novelistic representations of Islam over the last decade. We will be particularly interested in understanding how ideas about religion intersect but do not overlap with ideas about race, and how the question of opportunities for Muslim women has become a contemporary preoccupation. Texts: Readings will include: Edward Said’s Covering Islam; Junaid Rana’s Terrifying Muslims; Afzal-Khan; Updike; Amis; Hamid. Requirements & Grading: Midterm exam – 25%; Final exam – 30%; Course blog (250 words weekly) – 15%; Short research essays (4, 2 pages each) – 20%; Participation – 10%. E 379R (Topic: Slumdogs and Millionaires: Class and Indian Fiction) and 379S (embedded topic: Slumdogs and Millionaires: class and Indian fiction) may not both be counted. Description: The recent success of /Slumdog Millionaire/ (2008) has reopened discussions about the representation of class and poverty in India. The reactions to the film have been intensely partisan: some of have praised the humanizing of the poor while others have remarked that the fantastic rags-to-riches romance hinders any serious investigation of poverty. At every occasion, though, this discussion of class and poverty has been irrigated by the ideological streams of the middle and upper-classes, especially when it comes to their own solutions to and strategies for dealing with the persistence of poverty. Still, this representation of the poor, the underclass, the peasant, is shrouded in a patina of authenticity: this is how the poor really survive and imagine their life worlds. These aesthetic moves have become even more important in recent years as ruling parties in India have sought to demonstrate the country’s viability as a major world economic power. In the 2009 elections, for instance, the Indian National Congress Party ran television ads touting its economic policy credentials, set to the tune of “Jai Ho!” (the final song-and-dance sequence of the film). At the heart of all discussions of poverty are questions of blame, and this course will interrogate how aesthetic strategies intersect with certain ideological moves in the representation of Indian poverty. We will begin the course with Vikas Swarup’s /Q&A/ (the novel on which /Slumdog Millionaire/ was based) and examine alternative representations of poverty from the banal (/English, August/) to the magical (/God of Small Things/), from the gritty (/Delhi Noir/) to the witty (/White Tiger/), in order to map out the range of strategies used to aestheticize and politicize poverty. Texts: Adiga, White Tiger; Chatterjee, English, August; Chaudhuri, The Vintage Book of Modern Indian Literature; Desai, The Inheritance of Loss; Mistry, A Fine Balance; Roy, God of Small Things; Sawhney (ed. ), Delhi Noir; Sinha, Animal’s People; Swarup, Q&A. Requirements & Grading: Paper proposal, 2-3 pages (10%); Rough draft, 8-10 pages (25%); Annotated Bibliography, at least ten sources (15%); Final Paper, 15-20 pages (30%); Blog posts, every week, 250 words (10%); Participation (10%). * Disability Accommodation: The University of Texas at Austin provides upon request apt academic accommodations for qualified students with disabilities. For more information, contact Services for Students with Disabilities at 471-6259 (voice) or 232-2937 (video phone). Recently, both Postcolonial Studies and Subaltern Studies have suffered from critiques from within as important thinkers in both traditions have begun to disavow what those projects were about. At the same time, a dissident movement of Marxist and materialist thinkers have also attempted to situate different critiques of both movements as inadequately attentive to history and excessively concerned with textuality and discourse. This class considers the implications of these new developments on the study of literature from the postcolonies and neocolonies of today. Figures that we will consider: Guha, Chatterjee, Chakrabarty, Bhabha, Spivak, Said, Chibber, Brennan, Chrisman, Perry, Lazarus, and others. Description: This class will consider the long arc of Marxist thinking about literary production. We will be interested in examining how debates within the Marxist tradition inform our understanding of contemporary literary theory as well as arriving at an understanding of materialist theories of literature. Texts: Readings for the course will include: Marx’s notes on art; Lukacs on the European novel; Jameson on Postmodernism; Williams’ Marxism and Literature; Trotsky’s Literature and Revolution. Requirements & Grading: 2 short essays (4-5 pages) – 50%; final paper (78 pages) – 30%; quizzes – 10%; participation – 10%. Texts: Readings will include: Edward Said’s Covering Islam; Junaid Rana’s Terrifying Muslims; Fawzia Afzal-Khan; John Updike; Martin Amis; Mohsin Hamid. The recent success of Slumdog Millionaire (2008) has reopened discussions about the representation of class and poverty in India. The reactions to the film have been intensely partisan: some of have praised the humanizing of the poor while others have remarked that the fantastic rags-to-riches romance hinders any serious investigation of poverty. At every occasion, though, this discussion of class and poverty has been irrigated by the ideological streams of the middle and upper-classes, especially when it comes to their own solutions to and strategies for dealing with the persistence of poverty. Still, this representation of the poor, the underclass, the peasant, is shrouded in a patina of authenticity: this is how the poor really survive and imagine their life worlds. These aesthetic moves have become even more important in recent years as ruling parties in India have sought to demonstrate the country’s viability as a major world economic power. In the 2009 elections, for instance, the Indian National Congress Party ran television ads touting its economic policy credentials, set to the tune of “Jai Ho!” (the final song-and-dance sequence of the film). At the heart of all discussions of poverty are questions of blame, and this course will interrogate how aesthetic strategies intersect with certain ideological moves in the representation of Indian poverty. We will begin the course with Vikas Swarup’s Q&A (the novel on which Slumdog Millionaire was based) and examine alternative representations of poverty from the banal (English, August) to the magical (God of Small Things), from the gritty (Delhi Noir) to the witty (White Tiger), in order to map out the range of strategies used to aestheticize and politicize poverty. Texts: Salman Rushdie, Satanic Verses; Faiz, Rebel’s Silhouette; Sinan Antoon, I’jaam; Mahmoud Darwish, Unfortunately it was Paradise; The Qur’an; New York Times, Open Secrets. Requirements & Grading: Midterm paper (5-6 pages) – 25%; Final paper (8-10 pages) – 30%; Course blog (250 words weekly) – 15%; Short research essays (4, 2 pages each) – 20%; Participation – 10%. Course Description: Two important historical trends have marked the development and recognition of “Indian literature” as a global (rather than a strictly national) phenomenon. First, the patterns of migration of South Asians since the beginning of the Raj moved Indians to various parts of the British Empire and created a network of ambassadors and webs of affiliation throughout the world for South Asian culture; the fact of colonial schools which produced English-speaking Indians is not incidental. Second, the celebrity of Rushdie as the premiere Indian writer helped to produce a niche market within the publishing world for books about and by South Asians (usually represented by the big, national novel). To this must also be added the contemporary rise of India as a leading world economy which has raised the demand for and curiosity about Indian culture within the global marketplace. This course will investigate the production of a “global Indian literature” – paradoxically cosmopolitan and national – as made up of the intersecting experiences of Indians outside of India and the demands of the literary market (international publishing houses and the big literary prizes). All of the writers that we will consider have won major national and international prizes (the Nobel, Man Booker, Commonwealth Writers, Pulitzer, etc. ), and this will allow to think about what kinds of issues, what kinds of histories, and what kinds of forms tend to predominate in this body of writing. Grading: Weekly blog posts, 250 words (20%); Midterm (20%); Final (30%); Paper, 6-7 pages (20%); Participation (10%). E 379R (Topic: Literary South Asian Islam) and 379S (embedded topic: Literary South Asian Islam) may not both be counted. Course Description: This course will examine how modernity is experienced through the eyes of religious believers, those who adapted their faiths to modernity, those who abandoned Islam for cosmopolitanism, and those who found answers in returning to what they believed were more foundational moments in the history of the religion. Reading texts from late-colonial India to the post-Independence moment, this class will explore both the potentialities and the pitfalls with understanding something like a composite Muslim identity in South Asia, as that identity is cleft by class, gender, caste, linguistic, sexual, racial, sectarian, and geopolitical divisions. Figures will include: Thanvi, Ahmad, Ruswa, Ali, Faiz, Manto, Reza, Chughtai, Rushdie, Nasreen, and Naheed. Grading: Research proposal: 10%; Rough draft: 15%; Draft bibliography: 10%; Annotated bibliography, 15%; Final paper: 30%; Course blog: 20%. This course examines the encounter between cultures and societies during the process of colonization. Our texts are Nigerian, Zimbabwean, Indian, Irish, and Kenyan and their encounters are primarily with twentieth-century English and American powers as they are seen in schools, colleges, and educational networks, but also through industry, bureaucracy, police forces, and legal authorities. We will be interested in this class to ask how it is that the mind of a colonized person is shaped through the encounter with colonialism, how the language of colonialism creates patterns of subjection as well as opportunities for resistance, and why the fact of colonial education became a repeated theme in the imaginative writing produced by colonized peoples. There is one central question that this class will ask (though most of the texts will answer in the negative): does the fact that colonialism manages to educate some who would likely never have any access to education otherwise redeem it? The same question asked another way: how responsible is colonial education for the fact of nationalism and anti-colonial resistance in a colonized society? Alongside this inquiry we will map the ways that English becomes simultaneously a national and a global language. “Premchand and Language: On Translation, Cultural Nationalism, and Irony.” The Annual of Urdu Studies 28 (2013): 149-64. “When the Pen was Mightier than the Sword: The Radical Career of the Progressive Novel in India,” A History of the Indian Novel in English, ed. Ulka Anjaria. Cambridge: Cambridge University Press, 2014. “Slumdogs and Millionaires: facts and fictions of India’s economic (under)development.” The Slumdog Phenomenon: A Critical Anthology, ed. Ajay Gehlawat. London: Anthem Press, 2013. 91-105. “Lavish Weddings and Nostalgic Delhis: Anticolonial Aesthetics in Ahmed Ali’s Fiction.” The Two Sided Canvas: Perspectives on Ahmed Ali, ed. Mehr Afshan Farooqi. New Delhi: Oxford University Press, 2013: 151-73. 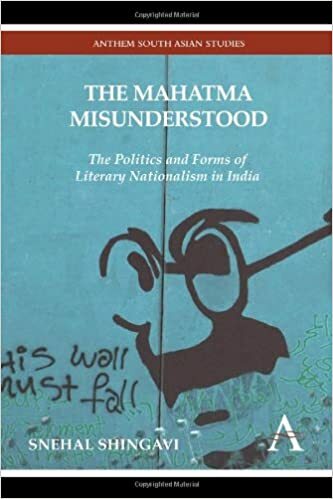 “The Mahatma as Proof: the nationalist origins of the historiography of Indian writing in English.” Nationalist Ideology and the Historiography of Literature in South Asia. Ed. Hans Harder. New Delhi: Social Science Press, 2010: 353-75. “Martin Espada.” The Facts on File Companion to Twentieth Century American Poetry. Ed. Kimmelman, Cone, Huff. New York: Facts on File, 2007: 182-3. “Telecom workers fight privatization.” The Great PTCL Strike against Privatization. Lahore: Shanakht Press, 2005: 20-30.